Get answers to questions about Sunny Bunny’s plastic Easter eggs, toys, & treats. These are the best Easter eggs made by people with disabilities. Learn how purchasing discounted/bulk priced eggs, Easter toys, & candy provides meaningful employment to those in the Springfield, MO community. Is Sunny Bunny Easter Eggs a not-for-profit organization? Yes, Sunny Bunny Easter Eggs is a program of SWI Industrial Solutions,. SWI Industrial Solutions, was founded in 1966 under the name Springfield Workshop, which is a not-for-profit, 501c3 charitable organization with a mission to provide employment to people with disabilities. SWI Industrial Solutions currently serves over 230 adults with disabilities at its facility in Springfield, Missouri. Please visit http://swiindustrial.com for further information. We accept Mastercard, Visa and Discover. We also accept checks in advance of shipment date. Please note: We do not accept international forms of payment. If your church, civic organization or municipality is unable to pay for an order with a credit card, we will accept a purchase order, subject to management approval. Purchase orders must be preprinted or on letterhead, and faxed to 417-866-6485. Do the candy and toy filled eggs ship pre-filled and pre-assembled? If I place an order on the Sunny Bunny website, is it secure? Will my customer information be shared? Absolutely not! We will NEVER share any information you provide to us to outside parties. Your privacy is important to us. How do you ship Sunny Bunny Easter Eggs? 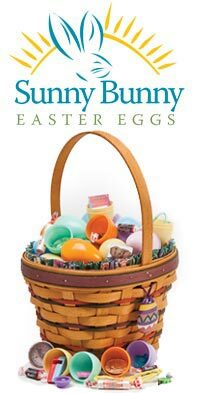 Sunny Bunny's plastic Easter eggs, toys, & treats are generally shipped via UPS. Shipping charges and delivery times will vary depending on your location. We ship to locations in the United States only. We do not ship to P.O. Boxes. Do you ship Sunny Bunny Easter Eggs outside the United States? No. We only ship to locations in the United States. Do you ship Sunny Bunny Easter Eggs to P.O. Boxes? No. UPS will not deliver to P.O. Boxes, deliveries must be made to physical addresses. Do you charge sales tax on Sunny Bunny Easter Eggs orders? No. Sunny Bunny Easter Eggs is an employment program directly related to the mission of Springfield Workshop, so we are not required to collect sales tax. The safety of our customers is of upmost importance. Therefore, we are unable to accept returns on Sunny Bunny Easter Eggs, as checking each returned plastic egg would be cost prohibitive. Can you hold my order and ship at a later date? Unfortunately, once orders are placed they are released immediately for processing and shipping. Are Sunny Bunny Easter Eggs easy-to-assemble, and do they stay together during shipment or while being hidden for an Easter egg hunt? Yes, Sunny Bunny Easter Eggs were designed to be easy-to-assemble, and they have a strong assembly joint. Thus, they are unlikely to come apart during shipment or while being hidden. To open a Sunny Bunny Easter, one must gently squeeze the egg at opposite sides of the joint, to break the seal. Children under the age of four may need adult assistance to open the eggs. Are Sunny Bunny Easter Eggs suitable for all ages? Sunny Bunny Easter Eggs contain small toys and candies that could pose a choking hazard for children younger than the age of three years. We strongly recommend that Easter egg hunts and the subsequent opening of Easter eggs be adult supervised to insure the safety of all children. Are Sunny Bunny Easter Eggs made from a safe plastic? Yes. Sunny Bunny Easter Eggs are made using polypropylene (PP), which have no known hazards. Additionally, Sunny Bunny's plastic Easter eggs have been tested in a professional laboratory using Infrared Spectroscopy (FTIR) per ASTM 1252-98 (02) and ASTM E334-01 (07). Can Sunny Bunny Easter Eggs be custom filled with items of my choosing? Yes, we can custom fill Sunny Bunny Easter Eggs with treats or products that you supply. Please keep in mind that candies must be individually wrapped, and products must fit inside the assembled egg. Additionally, please allow adequate lead times, preferably four weeks. Please call 417-866-1908 for quotes on custom filled Sunny Bunny Easter Eggs. A minimum quantity of 1,000 plastic eggs is required for custom filling. What size are Sunny Bunny Easter Eggs? Sunny Bunny Easter Eggs are approximately 2.375” in length and 1.50” in width at the widest point – similar to a Grade A Large from the grocery store.